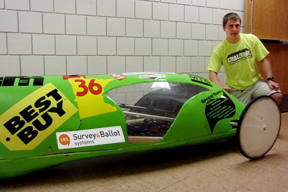 Survey & Ballot Systems (SBS), a leading provider of election services and online voting software, announces the sponsorship of Eden Prairie High School’s 2011 Supermileage Challenge Team. Each spring, the Minnesota Technology and Engineering Educators Association (MTEEA) holds a competition in which industrial technology students build and race one-person, fuel efficient vehicles powered by a single cylinder four stroke cycle engine. The competition gives students practical experience in vehicle design, fabrication and testing. Students compete in stock, modified, experimental and E-85 classes. The 23rd Annual Supermileage Challenge was held May 16 & 17, 2011, at Brainerd International Raceway, in Brainerd, MN. Teams of students from schools throughout Minnesota, as well as two teams from Wisconsin, competed in this year’s Supermileage Challenge. On May 17, 2011, the Eden Prairie Supermileage Team vehicle achieved 511 miles per gallon, placing them sixth overall in the modified division that consisted of nineteen teams. SBS’ sponsorship of the Supermileage Challenge team was inspired by the technological innovation and engineering talent shown by this group of nine Eden Prairie High School students. Donations helped the team procure materials and supplies used to construct the supermileage vehicle. For over 20 years, Survey & Ballot Systems has been providing customers with the tools and resources to conduct highly successful elections. The world’s top associations, cooperatives and organizations trust SBS to plan and manage their elections. SBS election services include traditional paper ballot elections, online voting, telephone voting and hybrid voting systems. If your organization could benefit from conducting the highest quality election available, with guaranteed and certified results, make sure to visit http://www.surveyandballotsystems.com for more information.